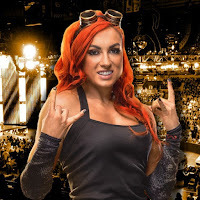 Becky Lynch has taken to Twitter to throw some more shade at WWE RAW Women's Champion, Ronda Rousey. As reported last month, officials weren't happy with some of the word choice that's been used between the two. Their social media feud went as far as Rousey warning Lynch that she was going to go off-script and beat "the living s--t out" of her. She also did a "Ronda on the Road" video earlier this month that has become infamous after an expletive-filled rant included her saying: "It wasn't a promo. [WWE] gave me other things to say I didn't f***ing say it." Becky Lynch shared a photo of Rousey and her husband Travis Browne on Friday with the caption: "Look how tough they are. RAWWRRRRR. But I'm told to go easier on them because they're getting upset." Today, she replied to the photo with: "Ronnie is very quiet around these parts lately. Wonder why?" Someone replied that it was probably the fines that were catching up with her, which Lynch said that she would pay them because she has that Funko money now. Another user speculated that Ronda Rousey was busy with her goats and husband (who is banned from RAW), which Lynch replied: "If she wants to spend time with a GOAT she should invite me around for din din." While also sharing the photo and comments, Lynch shared a video of herself doing a promo about Rousey. At the end of the video, the crowd cheered. "Talking like she's the baddest woman on the planet. I have never seen someone so protected in all my life. Goodness gracious! She thinks she's all anti-establishment but we got Ronda Rousey exactly where we want her. Cuz I said a long time ago that her titanium body will be left down by her weak mind. Now she thinks she's godlike, she's untouchable, and she's unbeatable, but that's where we want her because when Ronda feels so untouchable that's when she's put to sleep. Am I Right? Ronnie is very quiet around these parts lately. Wonder why? ?? I'll pay them. Got Funko money now.